Growing roses (Rosa spp.) rewards you with colorful, showy flowers that brighten the garden. But a rose plant may slow its flower production if you leave spent flowers on the plant until they dry and drop off on their own. Removing flowers after they wilt, called deadheading, helps keep the roses coming throughout the season, but it's important to do this in a way that suits the age and vigor of the rose plants you're growing. Stop deadheading as cold weather approaches. Like all plants, a rosebush reproduces by producing flowers that eventually make seeds. Deadheading interferes with setting of seeds, stimulating most rose plants to continue growing new stems and producing more flower buds. Roses have leaves made up of three to seven leaflets; a general rule of thumb is to remove the flower stem at a point behind the spent flower where you see the first leaf with at least five leaflets, making a slanted cut just ahead of this leaf. When making the cut, you can also help promote a wide, well-spread rosebush by cutting just in front of a bud that faces outward. This results in new growth that points outward, also helping allow light to reach all parts of the plant. Disinfect your cutting tools by wiping the blades with a cloth soaked in rubbing alcohol between cuts, to prevent spread of plant diseases. 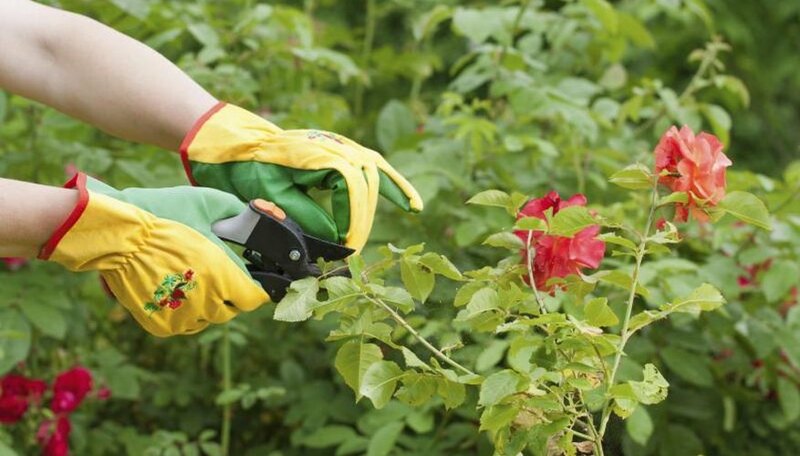 It's best not to deadhead a rosebush too aggressively when the plant is young, because it could interfere with the plant's general vigor and prevent it from becoming a strong, healthy plant. During a rose's first season in the garden, trim off faded flowers just behind the flower itself, leaving the rest of the stem intact so it can continue using all its leaves to produce energy. If you have an older plant that's isn't a vigorous grower or has slowed its growth and you want to strengthen it, it's best to deadhead this plant just behind the flower itself, rather than trimming back its stem. This approach preserves as many leaves as possible, helping the plant store the most energy and improve its vigor. For some roses, such as the hedgehog or rugosa rose (Rosa rugosa), the colorful seed capsule, or rose hip, is an attractive feature, so you may not want to deadhead this type of rose. For these roses, clean away the dry flower petals with your hand, leaving the swollen base of the flower, which becomes the hip. The rugosa rose grows in U.S. Department of Agriculture plant hardiness zones 2 through 9. Other bushy rose varieties, called shrub roses, usually have a single, abundant flush of flowers in early summer, without a second blossoming or with only a few flowers later in the season. Because of this, deadheading shrub roses doesn't promote more flowers. In summer, after a shrub rose blooms, remove the dry petals to tidy the plant, but leave the flower bases on these plants to allow colorful hips to form. When deadheading roses, it's not necessary to seal the cuts on small stems, because these seal quickly on their own. For larger stems, or if you have problems with cane borers, it's a good idea to seal the cut surface with a drop of white glue or shellac. In addition to helping the cut surface seal quickly, this treatment also helps keep pests from entering the plant through the fresh cut. Most roses grow in USDA zones 5 through 9, although this varies with the species and cultivar. In areas with cold winters, it's important to stop deadheading a few weeks before the first frost, so you don't stimulate the plant to produce tender new growth that's easily damaged by cold. What Flowers Grow Well With Roses?